Resonance frequency breathing is a way of breathing (slow relaxed diaphragmatic breathing at around 3-7 breaths per minute) that has a regulating effect on the autonomic nervous system and other key body systems such as the circulatory system. This type of breathing, (when practiced for a period of time and in the right conditions), calms the body’s fight and flight response, increases the activity of the parasympathetic nervous system and the vagus nerve. Calming the fight and flight response and activating the vagus nerve is important for helping us cope with the damaging effects of stress and also for helping the healing process. Resonance frequency breathing also stands out as a breathing technique because of the way it affects our physiology. When a person breathes at their resonance frequency their respiratory, cardio-vascular and autonomic nervous work can together in a synchronized manner and function more efficiently. The reasons why this happens are very interesting and have to do with the laws of physics and the physiology of homeostasis (ie. the body’s ability to maintain stability under changing conditions). If you want to know a bit about the physics and physiology of resonance frequency breathing please read the next section, if not you can skip over this section. The term “resonance frequency”, as used here, comes from physics and describes the frequency of oscillation that enables an oscillator to respond to the forces acting on it and express its maximal (natural and undampened) amplitude. This definition can be hard to wrap your head around without some more information about what an oscillation is. So here is the text book definition of an oscillation. “An oscillation is the repetitive variation, typically in time, of some measure about a central value (often a point of equilibrium) or between two or more different states”. Oscillations occur in mechanical systems and in living systems like the human body. Most of our physiological processes oscillate e.g. breathing is an oscillation, heart rate variability is an oscillation, blood pressure oscillates, lymphatic circulation oscillates and so does metabolic activity, peristaltic activity in the gut, periodic nerve firing in the brain and autonomic nervous system and a host of other functions. All oscillating systems have a “resonant” or “resonance” frequency, a speed at which the size of the oscillations are maximised when some force acts upon it. Resonance frequencies help oscillating systems to interact with each other so that they can more respond effectively and adapt quickly and appropriately to changes in internal and external conditions (e.g. increase physical activity, stress, threat, temperature changes, metabolic activity etc). Breathing is one of the few oscillating systems in our body that is actually under our voluntary control. Breathing has the ability to entrain, organise and regulate other oscillating systems, helping them to also oscillate at their optimal (resonance) frequency. 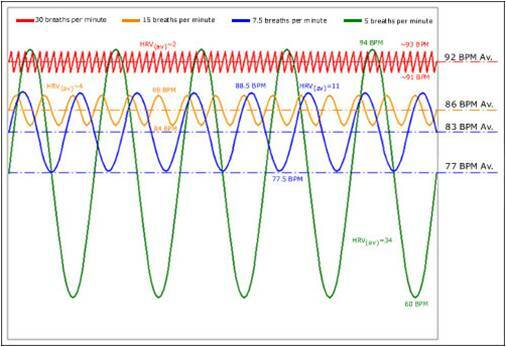 In this diagram you can see how changes in heart rate (amplitude of heart rate variability) are greatest, and go into phase with breathing when breathing is slowed down towards 5 breaths per minute (the resonance frequency of breathing). So the good news is we can choose our speed, style and depth of breathing to influence our body’s capacity for optimal function during the changing conditions of daily living. And we can use our breathing to tune other oscillating systems for better function. The circulatory system is a prime example of an oscillating system that can be affected in beneficial ways by resonance frequency breathing. Heart rate and blood pressure both oscillate. They interact with and respond to each other’s oscillations as well as with the oscillations of breathing and the oscillating activity of the autonomic nervous system. For example in a healthy person, a faster heart rate makes blood pressure go down and a slower heart rate makes blood pressure go up. Inhalation makes our heart rate go up and exhalation makes our heart rate go down. These are normal responses that happen every day. These types of co-ordinated responses do things such as protects our arteries from damage, improve uptake of oxygen and regulate our autonomic nervous system. While these normal responses tend to decline in people as they age or develop various diseases it seems that they can be improved with resonance frequency breathing. People with high blood pressure often have reduced activity of the vagus nerve and reduced sensitivity of the blood pressure regulating organs found in the large blood vessels (baroreceptors). This can contribute to their inability to properly regulate their blood pressure. When we breathe we create rhythmic oscillations or fluctuations in pressure in the abdominal cavity and the thorax. The increase in pressure in the chest cavity during a good ( i.e slow, relaxed and diaphragmatic exhalation), increases the amount of blood flowing back to the heart and also stretches the major blood vessels, stimulating baroreceptor organs that regulate blood pressure. The activity of the vagus nerve is also activated during this type of exhalation. Regular practice of slow relaxed, diaphragmatic breathing at the resonance frequency (ie. around 3-7 breaths per minute) has been shown to increase the tone and activity of the vagus nerve, improve sensitivity of the baroreceptors and improve health in various ways . Even though research into resonant frequency breathing has only been going on since the 1990s, humans have known about resonant frequency breathing instinctively. Hymns, chants, prayers and certain types of poetry create speech patterns that produce the resonant frequency. 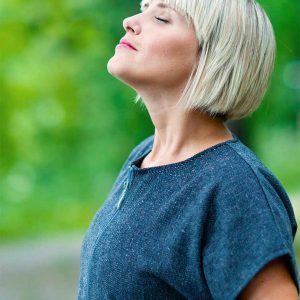 Some of the recent research into Resonance Frequency Breathing has shown that it can help people with a range of different conditions. Help patients with panic disorder, anxiety and depression. Reduces symptoms of fibromyalgia and irritable bowel. Lehrer, P., E. Vaschillo, and B. Vaschillo, Resonant frequency biofeedback training to increase cardiac variability: rational and manual for training. Journal of Applied Psychophysiology and Biofeedback, 2000. 25(3): p. 177-190. Hasset, A.L., et al., A pilot study of the efficacy of heart rate variability (HRV) biofeedback in patients with fibromyalgia. Applied Psychophysiology and Biofeedback, 2007. 32(1): p. 1-10. Katsamanis, M., et al., Psychophysiological treatment for patients with medically unexplained symptoms: a randomized controlled trial. Psychosomatics, 2011. 52(3): p. 218-29. Lehrer, P., Respiratory sinus arrhythmia biofeedback therapy for asthma: a report of 20 unmedicated pediatric casees using the Smetankin Method. Applied Psychophysiology and Biofeedback, 2000. 25(3): p. 193-200. Lehrer, P., E. Vaschillo, and B. Vaschillo, Heart rate variability biofeedback increases baroreflex gain and peak expiratory flow. Psychosomatic Medicine, 2003. 65: p. 796-805. Lehrer, P., et al., Biofeedback treatment for asthma. Chest, 2004. 126: p. 352-361. Lehrer, P.M. and R. Gevirtz, Heart rate variability biofeedback: how and why does it work? Frontiers In Psychology, 2014. 5: p. 756-756. Vaschillo, E. and P. Lehrer, Heart rate variability biofeedback as a method for assessing baroreflex function: a preliminary study of resonance in the cardiovascular system. Applied Psychophysiology and Biofeedback, 2002. 27(1): p. 1-27. Gevirtz, R., Resonance frequency training to restore autonomic homeostasis for treatment of psychophysiological disorders. Biofeedback, 1999. 4: p. 7-9. Stern, M.J., R.A. Guiles, and R. Gevirtz, HRV biofeedback for pediatric irritable bowel syndrome and functional abdominal pain: a clinical replication series. Appl Psychophysiol Biofeedback, 2014. 39(3-4): p. 287-91. Lin, G., et al., Heart rate variability biofeedback decreases blood pressure in prehypertensive subjects by improving autonomic function and baroreflex. J Altern Complement Med, 2012. 18(2): p. 143-52. Resonance frequency breathing is one of the breathing techniques used in Integrative Breathing Therapy and is included in the Better Breathing Better Health program for adults and the Health Breathing Healthy Child program. In individual breathing therapy sessions resonance frequency breathing is taught with the aid of heart rate variability biofeedback equipment. I also assess people’s heart rate responses to resonance frequency breathing (an indirect measure of cardiac vagal tone) during the breathing assessment. To make an appointment or if you would like more information please call or email us. We also have an audio recording of a guided resonance frequency breathing process. Its called the Perfect Healing Breath and is available on the products page of this website.